“Have you a relative or friend at the Front, fighting for King and Country? Would you like to send him a present of a ¼lb of high grade quality tobacco and cigarettes? This can be sent carriage free for every 6d subscribed to our Fund." "You can ensure your relative or friend receiving such a present, with the highly appreciated additional present of a BOX OF MATCHES, by sending to our Tobacco Fund the small sum of 6d. If you were to purchase such a quantity and yourself post it to your relative or friend, the tobacco and cigarettes alone would cost you 2s., and in addition, you would have to pay postage and run the risk of the parcel being lost in transit. 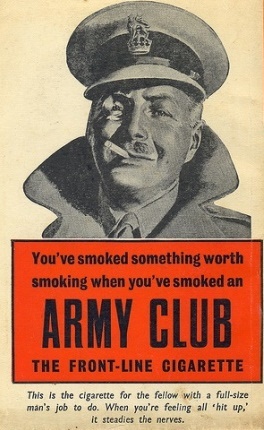 Delivery of your parcel is ensured, because the Military Authorities think so highly of our Tobacco Scheme that they have undertaken the free delivery of the parcels to our men in the trenches before the German lines."